How often do you hear someone refer to something as their guilty pleasure enjoyment? We’ve all uttered that sentiment. Yes, even me too. When I first started enjoying One Direction I remembered I would do anything to avoid it coming up in conversation. I knew all the connotations that came from admitting I enjoyed a “boyband” and on some level I was embarrassed because of it. If the inevitable came up and One Direction was mentioned I would make up excuses and labeled it as a guilty pleasure. Because, you know – a Tumblr full of 1D gifs is just a passing phase. I did this for a few weeks, until I realized I enjoyed One Direction and I was sick of giving a damn. Why did it matter if I liked them? It was that moment that I decided I didn’t believe in guilty pleasures. The whole basis of guilty pleasures is built on a concept of what we should and shouldn’t like. Only certain things are deemed acceptable. But who decides? How do the absurd groupings of redeemable pass times and “oh no you didn’t” pass times get decided? I think I’d like to give this all-mighty person a piece of my mind. There should be no shame in the entertainment we enjoy. Say you like the trashiest reality show. It doesn’t mean anything about your character, your life, or your other hobbies because you watch every episode. You could easily like said reality show and watch a documentary on the human brain next. Or you could binge marathon another reality show. WHO CARES. Nobody. That is who. We need to let the societal pressure and judgement of guilty pleasures go. We all find happiness and joy from different things and nobody should feel embarrassed over theirs. You find enjoyment from something and that’s it. Why does it have to be more complicated? When you say you have a guilty pleasure everybody knows that you actually like it anyways. We also know you just don’t want to admit it. Why do we run around in circles like this instead of coming out and admitting it? Once over coffee I went off on a tangent about guilty pleasures and my friend explained that to her, guilty pleasures were things she enjoyed but didn’t know how to explain the appeal. Okay, but why do you need to justify why you like it? That still sounded to me as a version of “Maybe I shouldn’t enjoy this.” Just like what you like. Go at it with full intensity – no justifications required. 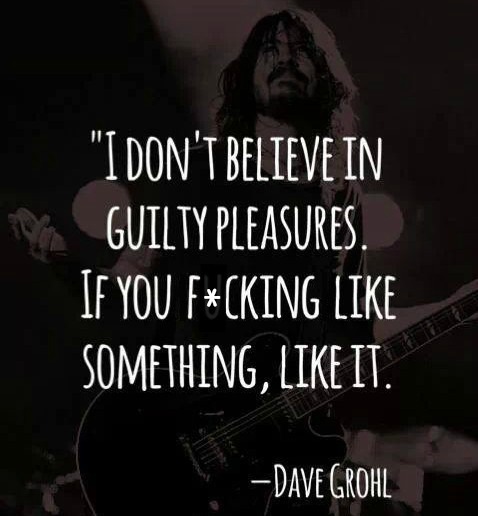 Wise words from one of my favorite human beings in existence, Mr. Dave Grohl. I now unabashedly and loudly proclaim my love for One Direction. It’s even become my trademark of sorts (admit it you think of One Direction and I’m guessing if we’re friends you think of me.) Guess what? I have much more fun proudly admitting my enjoyment of them as people and of their music. I have had the time of my life getting excited over new album releases and attending concerts. I’ve been able to form friendships with fellow fans, travel to new cities to see the guys live, and made memories that I won’t ever forget. None of this would’ve happened if I kept One Direction my guilty pleasure. Isn’t it better to live by actually embracing the things we enjoy most? Is there anything you were once ashamed to admit you enjoyed more than a “guilty pleasure”? P.S. 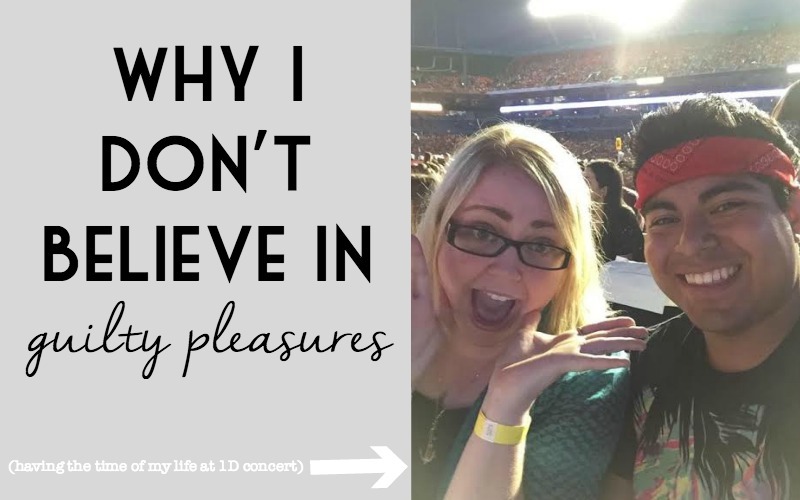 – I’ve been fairly vocal about my love of the band on the blog, I once even wrote about Harry Styles inspiring my Miami concert outfit.